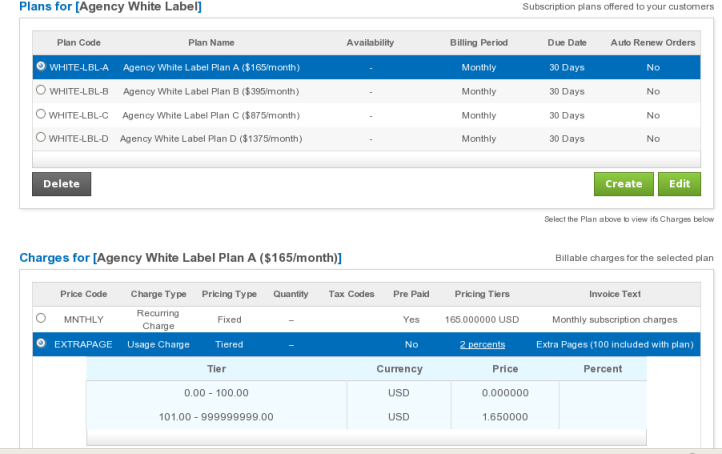 This whitepaper shows a typical configuration for pre-paid subscription plans. 100 web pages are included at no additional charge, beyond which a usage charge of $1.65/page is levied each month. In order to maximize cash-flow, the web hosting company would like to charge the customer up-front when the sign-up. While this can be done for the monthly $165 fee, the usage charge will necessarily have to be post-paid since the actual consumption will only be known at the end of the month. 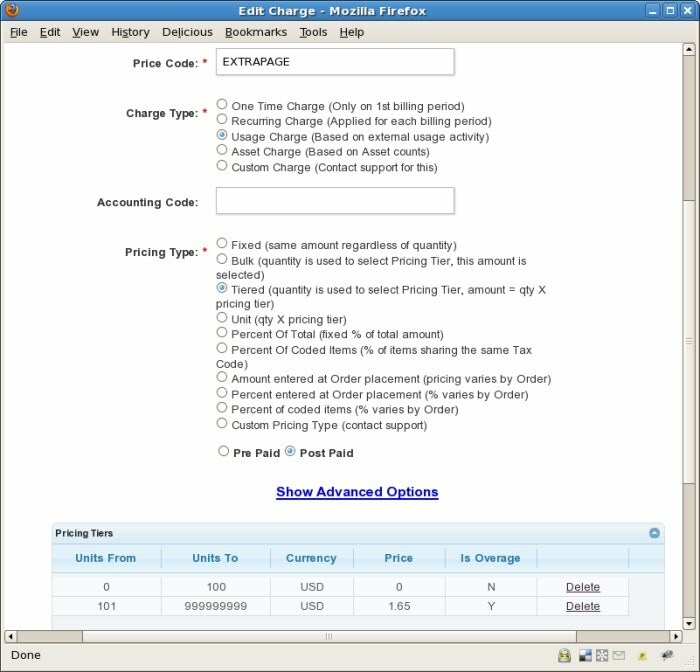 Now we configure the charges associated with the Plan. Click the "Create" button on the lower "Charges" table. 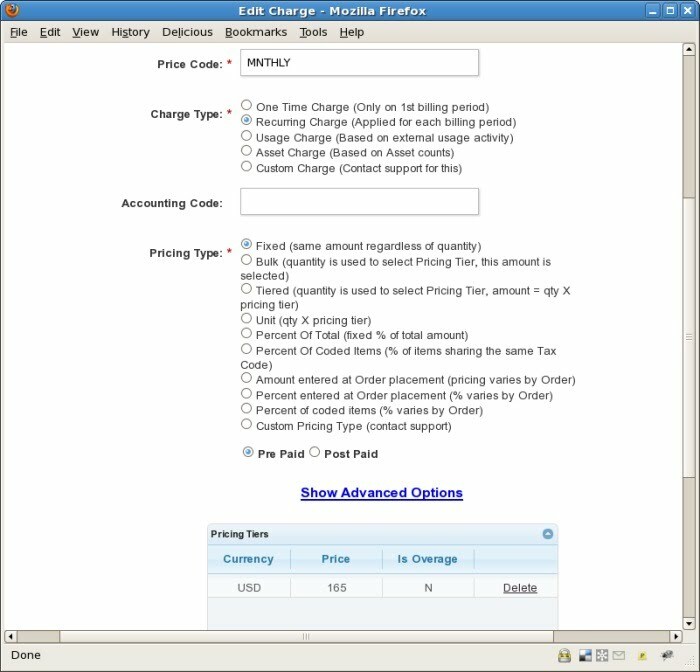 The monthly recurring charge can be configured as seen in Fig 2. Note the "Pre Paid" selection on the radio button. Before saving this configuration, click on the "Show Advanced Options" link and select the "Pro-rated Charge" checkbox. With this selection, a customer signing up in the middle of the month will be charged proportionately. After saving the monthly charge, add another charge. Since the 1st one hundred pages are free, we can configure the Pricing Type as "Tiered". The Charge Type is set to "Usage" based, indicating that usage data will need to be uploaded to system. 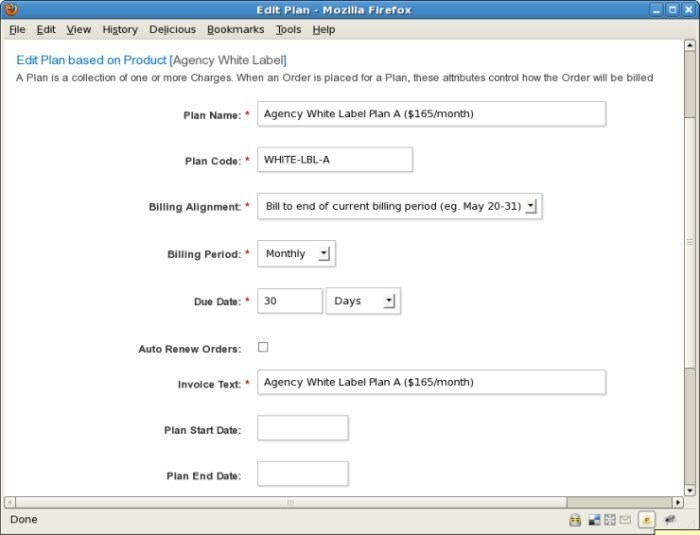 Similarly, multiple Plans could be configured with different charges and prices. Fig 4. below shows a sample pricing structure. Now you may create an Order using any of these plans and the Customer will be billed accordingly.